In the modern world, the idea of being bored is, frankly, a little bit bizarre. There has literally never been more to do, see, hear or experience at any other point in human history. The problem is that it’s not that likely that everyone will want to do, see, hear or experience all of the same things as each other. In fact, plenty of people end up trying plenty of different things and getting bored. It’s only natural; human beings often find themselves switching from one thing to another. But what if you want to find something really interesting? Something you can really stick to and enjoy long term? Well for that, maybe you should try something just a little bit different. Here are three awesome and unusual hobbies that are sure to get you completely and totally hooked. Yep, you heard right, trapeze. Those death-defying swinging stunts you see at the circus. If you want the chance to turn yourself into the human equivalent of a ballistic missile, then there are plenty of classes available that can help you “catch” (sorry) the big for this incredibly exciting and addictive hobby. You’ll be amazed at the pace that a lot of these classes move. By the end of your lesson, you’ll be your first attempts at all of those incredible flips and tricks you thought only possible for the world’s top gymnasts! And don’t worry, there is always going to be a safety net so it’s actually a lot less dangerous than you might first thing. Perhaps you want to take to the air for some slightly longer periods of time? Well, then why not think about getting your pilot’s license? There isn’t a person alive who didn’t dream of being a pilot when they were a kid! Soaring high above the clouds and looking down at the earth is one of the most exhilarating experiences in the world, and it’s made even more so when you’re the one who’s in complete control. Soar Aviation offer a whole variety of classes going all the way from a free introductory trial to advanced flight classes. You really will believe that you can fly! Ever wanted to be a hamster? No? Well, you will once you get a taste of the ridiculous and ridiculously fun new craze that’s sweeping the globe. Zorbing is as simple as it is hilarious. You get inside a giant, squashy ball of transparent plastic and then you roll down a hill. That’s it! Well, that’s not quite it. 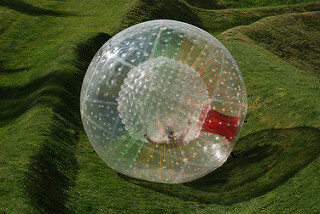 Because the variation in the kind of riotous fun that you can have while Zorbing is actually pretty impressive. You can do it on your own, while some balls accommodate multiple people. Not only that but you can even use them on the water, which adds a whole extra layer to the hilarity that ensues from trying to remain stable while inside a giant hamster ball. This entry was posted in Fun and Games. Bookmark the permalink.